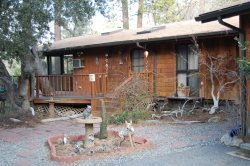 There are two lakes located in the Idyllwild area, as well as a year round flowing creek. Lake Fulmor is located 15 miles up the mountain from the 10 FWY in Banning, CA. Rainbow trout are stocked here from Spring through late Fall. There are also largemouth bass, catfish and bluegill. A handicap access fishing pier is available as well. Lake Hemet is located 25 miles east of the city of Hemet. Rainbow trout are stocked year-'round here. During the summertime, they like to congregate in the deeper holes near the dam. Channel catfish are also planted here during the summer months. There are also some Largemouth bass, crappie and bluegill here. Swimming and wading are prohibited. Strawberry Creek is located between the two lakes to the north and south. It runs year round and is normally stocked with rainbow trout.